HITSter Philipp Gerstner was now honored by the Karlsruhe Institute of Technology (KIT) for the best diploma of his class. 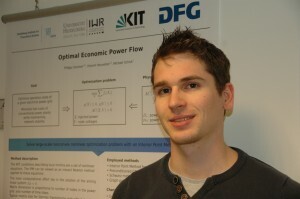 Philipp studied Techno-Mathematics at KIT from 2008 till 2014 and achieved the best overall grade among all 15 graduates in his year. He wrote his thesis about modeling and numerical simulation of the spreading of wildfires. Philipp joined the DMQ group at HITS in April 2014 as PhD-student where he is now working on mathematical methods for optimizing power system operation.